Alvi Armani's Vitruvian method focuses on Vitruvian Design - Natural Hairlines, Maximum Density, Strategic Placement and Temple Angle Closure. This combination ensures every client's hair restoration is totally undetectable. Our philosophy at Alvi Armani is that a hair transplant should NEVER be recognized by anyone - be they strangers, or even your closest relatives. Dr. Armani's Vitruvian FUE method focuses on delivering this for each of our patients. 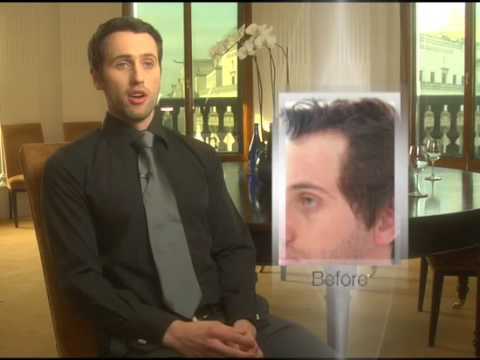 Alvi Armani hair transplants offer a unique approach to hairline design. Everyone's face differs, no two hairlines are equal. It is not simply designing a new hairline, but actually requires restructuring around someone's entire facial area according to individual characteristics. Patient's age and ethnic background also decide hairline placement on the scalp. Grafts average 100-120 grafts per centimeter of scalp. Alvi Armani's cutting-edge hair transplant procedures involve replicating the natural density of the scalp by inserting 80-120 grafts within that same square centimeter. Hair transplants performed at lower densities ranging between 20-30 grafts per square centimeter, appear spotty or see through fostering unhappy patients seeking further work. High density hair restoration procedures performed by Dr. Antonio Armani's physicians are a major technological breakthrough sought by patients around the globe. perfectly placed, bringing together a complete unit of natural flowing hair. Positioning of individual grafts varying thousands of angles holds great importance into mimicking nature's irregular growth patterns. Dr. Antonio Armani, accompanied by trained hair transplant physicians and technicians, meticulously implant single follicles using the latest technology. Dedication to excellence while truly delivering undetectable results introduces a new era in hair restoration procedures. Temple angle closure possesses a high degree of difficulty within the hair transplant industry. Only professional skilled hair restoration physicians should perform the procedure. A particular issue involves angling each hair along the hairline connecting it to the side brow. Individual hairs have slight forward and side angling, producing continuous natural looking hair, appearing seamlessly unnoticeable. Alvi Armani duplicates natural temple angle regions restoring youthful authentic appearances using artistic methods displaying natural looking temple angles.